Developer Quote: "The object of the game, Tri It!-Triangle Puzzler, is to flick-move triangles on a puzzle board, guiding them onto colorful solution tiles." - Four difficulty levels and 120 puzzles! - New, innovative game play! - Appeals to casual and advanced gamers. - Easy to learn, difficult to master. - Simple, intuitive flick controls. - Triggers, warps, swappers, and more! - Optional music and sound effects. - Beat your best times on all puzzles! 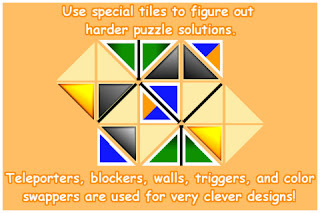 Though Tri It!-Triangle Puzzler may have you scratching your head figuring out some moves, don't despair because special tiles are available to help you discover the solution. By the same token, these very tiles could work against you, so beware! Look out for walls and certain triangles which will block your progress for you will have to find a way around them! Trigger, Warp and Swapper tiles can all aid (or maybe harm) you in your battle to correctly place triangles on the board tiles. Think twice before you use each type so you can solve these fun puzzle boards accurately! 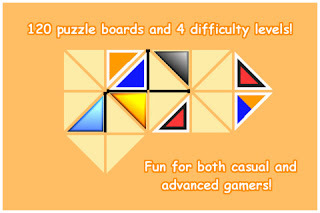 COOL CONCLUSION: "Tri It!-Triangle Puzzler is loaded with challenging, addicting fun in which your brain uses all its logic to solve shape fitting puzzles!" --iOS/Age Rating: This app requires iOS 3.1.3 or later. Rated 4+.